Did You Ever Wonder: What if Palin Had Run? This entry was posted on Saturday, December 3rd, 2011 at 18:36 and is filed under Election 2012, GOP Candidates, Mitt Romney, News, Newt Gingrich, Politics, Sarah Palin, Tea Party. As most of you will remember, I have been an ardent supporter of Sarah Palin’s notion of “sudden and relentless reform.” Like many who believe that’s what our republic needs, I was disappointed when she announced that she would not seek the GOP nomination for President. She said that she doesn’t need a title to help drive the sort of reforms and restoration the country needs. Nevertheless, one of the things that has come along is a new HotAir Poll that shows that at least some Republicans think otherwise, because Governor Palin is still very influential. Perhaps most stunning of all, when respondents were given a choice between the current front-runners and Sarah Palin, in a three-way race, Sarah Palin won. I am not surprised. That’s simply stunning. What this implies about the electorate is pretty clear: Left with the current front-runner as their choices, at present, Palin supporters seem to shift nearly six to one in favor of Gingrich when the field is reduced to just two. It also suggests quite plainly that given an option to vote for Sarah Palin as opposed to either of these two, more GOP voters would jump at the chance. It’s for this reason that when media tells us “the field is settled” that I wonder about the credibility of that claim. After all, it seems to me that among the electorate, it’s not such a settled question as some have thought. It also offers us a little insight into the supporters of Palin, and where they may head with their votes if Gingrich and Romney become the only choices. The message here is that Sarah Palin is still very powerful as a force within Republican ranks, and her endorsement may be more valuable than the former Alaska Governor might be inclined to believe. It also indicates that Sarah Palin’s general positions are likely more favorable to a wider segment of Republicans than either of the current “front-runners.” It was my thesis early on in this campaign season that Sarah Palin is the real front-runner. On the basis of this poll, I stand by that determination even if she’s not running, in fact. The favor upon with which she is generally looked by Republican voters is much more thorough than some may have noticed, but it also says something about where the conservative base of the GOP really is, with respect to their opinions on various issues. The reason Sarah Palin has always been out front is primarily because voters identify with her positions, and her general outlook on the country and the necessities of reform. Since she’s not running, this may lead some to wish for her to reconsider, as such “draft” movements have been persistent since she made her announcement on October 5th. What I think this really tells us is just how unifying the right candidate could be for the GOP under the right circumstances. We have learned recently that polling showed most of Herman Cain’s support would likely turn to Gingrich if Cain withdrew, and now that he has, I expect that will probably occur, but this also should transmit a thorough warning to Newt Gingrich: “You’re still only a second (or third)choice.” That should highlight something very important that the Gingrich camp simply cannot afford to ignore about the volatility of conservative voters who have begun to feel for months that they might be forced into a choice among the lesser of evils. Gingrich should take no comfort in finding that Republican primary voters may see him as a slightly lesser evil than Willard “Mitt” Romney. The message to the GOP candidates couldn’t be clearer: Think about what Sarah Palin has represented and why she appealed to the Tea Party and conservatives, and then figure out how you can earnestly and sincerely implement the reforms she has advocated. Show Republican voters how you will beat Obama and reverse Obamacare as two first stops along the way to restoring the country, and you might find yourself the winner, not only in the primaries, but at the polls that really count, next November. She may not be running, but don’t let the media fool you: Sarah Palin is a vital player of this race, candidate, or not. 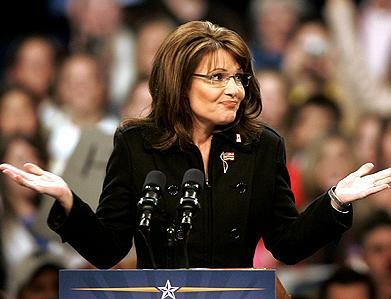 14 Responses to Did You Ever Wonder: What if Palin Had Run? The poll is just as I would have suspected. If Palin decides to endorse someone, it should be anytime now. As of this time, the best candidate is Gringrich. Even with his "colorful" past, he will beat Obama. There is no way America would elect Palin…BE REAL. That's why she dropped out. Heaven save us from Palin and Paul supporters…all delusional. Bush -> Romney = Safe 'electable' progressive establishment failures. Reagan -> Palin = Crazy, 'unelectable' conservative self-made successes. yes, you hit the nail on the head! I suspect that a Gingrich presidency would be much like a Nixon presidency. Nixon created the EPA, Gingrich voted for the Dept of Education. Both of these departments should be on any GOP nominees cut-out-by-the-roots list. Like Newt, Nixon was also a very bright, articulate man, and pushed big-government solutions left and right. He took us off the gold standard, and tried out federal price controls. Newt has argued for climate control (Carbon-cap) legislation, and for setting up government-sponsored entities to run health care and space exploration. As for myself, I would vote for Gov Palin in a heartbeat if she enters. Until then, I'll send money to Ron Paul, even though I seriously disagree with his foreign policy. At least he talks about deep cuts in spending, and fervently for smaller government. Most importantly, I would never expect him to change his mind on a policy issue, even if the Mainstream Media had him in a full-court press. With Cain's exit, I think the future of the Tea Party movement gets cloudy. We needed a champion with a way of communicating with the middle class. So where do we write Sarah, to make our case for her entry? What's the matter Mark? I didn't agree with you? What's the matter with what? Palin said on Hannity that she didn't think her endorsement would carry much weight. That's ridiculous of course. I argued fiercely against the Erick Ericksons of the world who claimed Sarah was getting in "too late" months ago but practically, Sarah would retain her most fervent supporters – but absolutely would have a tougher battle against just her and Newt (and Romney) than she would have had before his surge. The problem is that while a lot of conservatives like her – they are not all uniformly exclusively for her per se. From the "committed' decides from back in July, Newt has the highest "committeds" now – by far and has a 50% lead in Florida. She can't get on the ballot now (i think i'm right on this) in SC, NH, FL or IA – so she at best would compete in CO/MN prior to SuperTuesday with an almost insurmountable lead by Newt. She risks the "can't make up her mind – doubleminded" charge without a CLEAR definition between her and Newt. Yes, she's BETTER on everything – but not like a Romney/Newt contrast. She seemed incredibly sullen and angry on the interview Thursday which really shocked me. I'm not sure if she ate some bad moose or had a fight with the kids – but there was nothing in her demeanor which led me to believe she was emotionally or mentally ready to jump back in. Remember – the "angry conservatives" (not just sympathetic tea partiers) only make up less than 25% to 30% of the GOP turnout. She'll get the majority of those but still has to appeal to a broader group of conservatives who are looking for inspiration – not whining. (which is why Newt is winning). In my opinion had she jumped in, she would have pre-empted a Newt surge altogether She likely would have faced a stronger Bachmann but with Cain out, a state like FL would have been much closer giving her a longer path. I'm a little disappointed actually with her performance since announcing she would not run. She was supposed to have been working hard to get conservatives elected at other levels and I haven't seen a whole lot of that. Maybe she is working behind the scenes. She won't endorse anyone and when asked 3 times by Hannity to give an honest assessment of Newt and Mitt – she refused, giving the same old lines of 'crony capitalism' and such which – frankly – have gotten a little old. My best hope for Palin now is that Newt presses hard to make her VP and entrusts HER with overhaul and reform of government as she did in Alaska. It would take away a general election perception of inexperience and like Hillary Clinton got as a NY Senator – make her extremely well equipped for a 2020 run. In the end she was absolutely wrong that she could make as big of an impact "without a title." A President Palin could have not only pressed for conservative policy – but as she did in Alaska, could have taught and persuaded – while using the power of the office to force Congress to bring her something that would reform the govt. Unfortunately even with those of us who are sold on her governing skills, right now she is only just talk. The subject of "Crony Capitalism" will never get old until it has withered and died. Why say otherwise, unless you think it ought to be ignored and continue. Your statement about that is wrong, so what does that say about the rest of your concerns? I'm going to keep this short. I'm calling BS on your comment. I think Michele Bachmann jumping in hurt Palin's chances and unfortunately, Ms. Bachmann isn't getting much positive coverage. Newt is quick, brilliant, and knowledgeable of Washington. Maybe he will pick Palin or Bachmann to get the tea party vote. It is sad that accusers are no longer showing proof to take down one's reputation. The media laughs about their power to destroy. Contrary to what some commenters seem to think, I believe the point of this article is not primarily "Sarah Palin should reconsider" (if only!) but that she is the first choice of nearly half Gingrich's supporters and a third of Romney's!